Saab and Hirsch have made it official: The Swiss producer of go-fast parts will now offer a full line of upgrades for Saab vehicles in North America. Beginning in the spring of 2011, customers will be available to order Hirsch Performance products at select Saab dealers around the country. 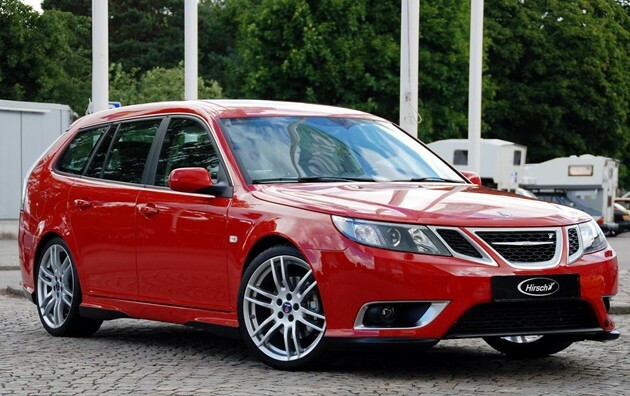 A variety of parts will be offered for 2007-2011 Saab 9-3s and 2010-2011 9-5s, including engine mapping upgrades, spoilers, aero ground effects, suspension tuning, exhaust upgrades and even interior upfits like a carbon instrument panel. The Hirsch parts will be installed at dealerships and will not hinder the vehicle's warranty. Pricing and availability will be announced in the coming months. Follow the jump for Saab's official release. Saab officially teams up with Hirsch Performance for high-performance parts originally appeared on Autoblog on Wed, 12 Jan 2011 18:31:00 EST. Please see our terms for use of feeds. The red 9-5 Aero waggy is so deliciously tasty. i have a soft spot for 9-3 aero's....they are smexy.